Have you ever heard of these concepts: impostor syndrome? The glass ceiling? How about the glass cliff? This was it: the famous glass ceiling – an unacknowledged barrier to advancement in a profession, especially affecting women and members of minorities. As I was still looking for an opportunity, I was offered a temporary role of acting CEO for a company that had recently nearly halved in size. Their future prospects were not extraordinary and, as much as being CEO could be considered a ‘big deal’ from a titular perspective, it simply did not feel right. I kept thinking why I, a stranger to that company, would be in a better position than any of their own team members to fix the situation by putting the company back on track. It felt like a set-up for failure, and definitely a road not worth pursuing. It did not take long for me to turn down the offer. Surprisingly, I discovered later that this phenomenon also has a name: the glass cliff. This is the supposed phenomenon of women being likelier than men to achieve leadership roles during periods of conflict, crisis or downturn, when the probability of failure is higher. These are high-risk leadership assignments for which women and diverse leaders may take the blame if the organization or situation does not rapidly improve under their leadership. A few years on, I find myself taking on roles with higher responsibility. As a relatively young-looking woman, most people who do not know me would never assume that I am the boss! I had to work to overcome that little voice playing in my head: “Maybe I should have prepared more before meeting them,” “can I really do this, it seems like everyone around here has so much more experience than I do?” and “am I right for this position?” These are the questions that dog me sometimes. But this is a sort of psychological trap known as impostor syndrome. It tends to be more challenging for women to internalise their accomplishments than it is for men. If you ever feel that you do not deserve to be where you are, know that you are not alone. Many other women out there feel the same way. Simply being aware of this should be enough for you to take a deep breath and overcome it. - Never let someone else define who you are – only you can do that. - Learn to be comfortable with being uncomfortable, or you will not grow; growth and comfort do not coexist. - Lean in! We have to accept that many professional sectors are still heavily male-dominated and, in order to change this reality, we have to get ourselves out there. Simply waiting for things to become different will not seal the deal – be part of the action. - Do not believe society’s assumptions around women. You do not have to simply accept, as fate, that your career will slow down after having kids or when you turn 30 – the fact that it happens to many people does not mean it happens to all. - Assume good intentions, do not search for myths and discriminating elements between the lines, and you will perceive fewer biases. Finally, the glass ceiling, glass cliff and impostor syndrome - it is important to know what they mean and that they exist, but once you are aware of them, I would urge you not to waste too much energy on them. Women are not a leadership quick-fix! 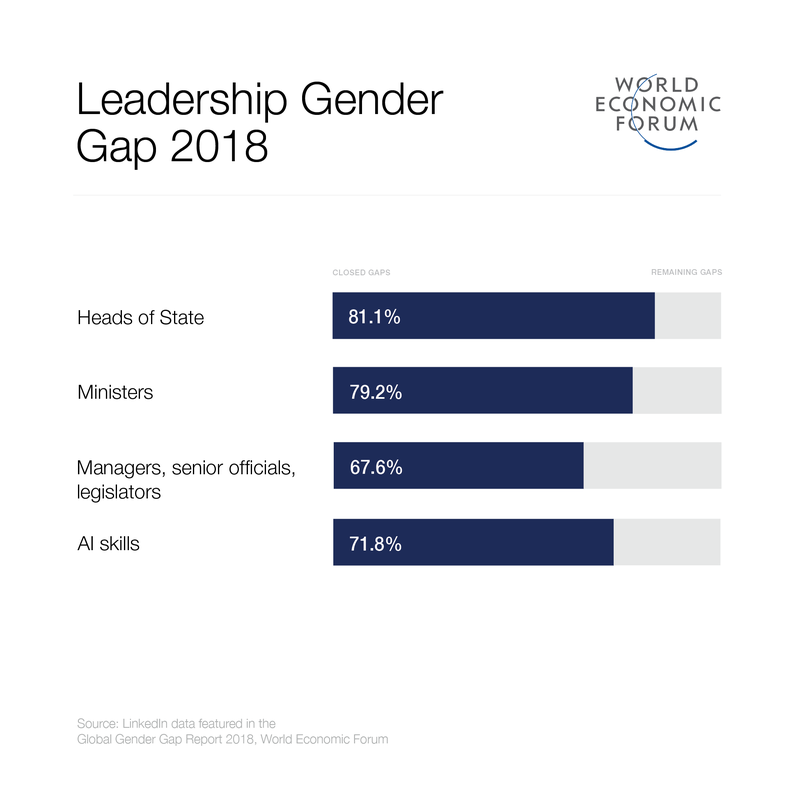 Despite the gender gap narrowing slightly this past year, according to the World Economic Forum’s Global Gender Gap Report 2018, women still face an uphill battle in leadership positions. And, it turns out, the higher women climb, the more biases, challenges and stereotypes they face. Digitalization has made it even more urgent to step up efforts to level the playing field between men and women, so that all have equal opportunities. Yet women are also underrepresented in fields experiencing job growth, such as engineering and information and communications technology, which leaves women at a high risk of displacement by technology. - Governments need to enact policies that foster gender equality and empowerment in the changing landscape of work. One example, inspired by Scandinavian practices, would be to provide affordable, day-long childcare. 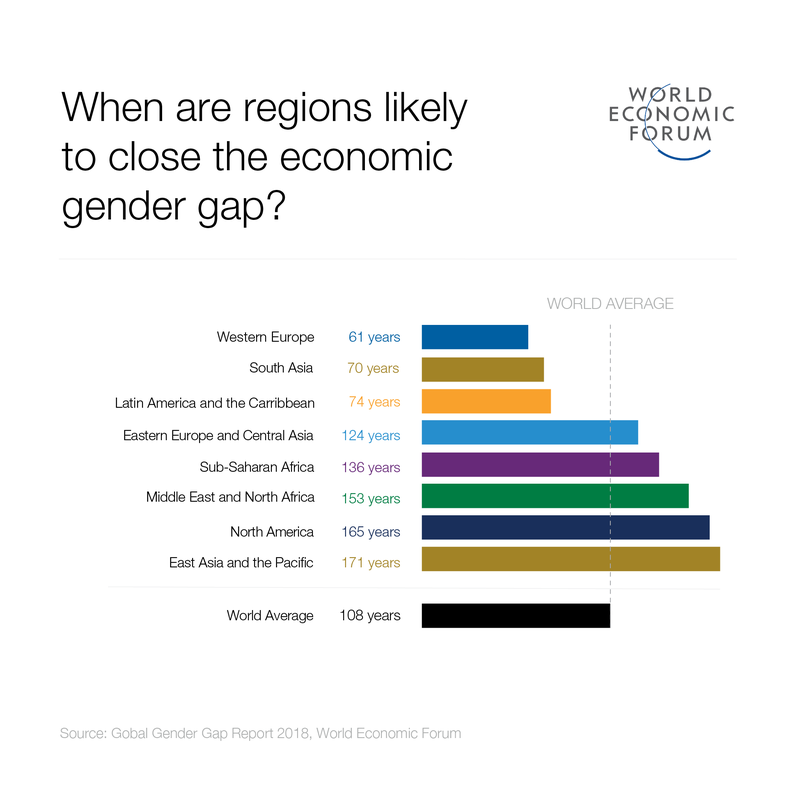 - Companies must make decisions in order to close the gender gap in leadership positions. Germany has already adopted a minimum quota of one-third of the supervisory board of some listed companies to be females. However, this may be not enough to close the gender gap. It may be necessary to apply such changes down the line as well to build a female talent pipeline across organizations. - Investors can play their role by proactively searching for women-founded companies in which to invest. For instance, in 2017 a little over 2% of total funding dollars went to all-women teams, while these deals represented a little over 4% of all venture capital deals in that year - which hints at the fact that female founders receive disproportionately smaller paychecks than male founders do! Finally – before you think that there is nothing you can do to change things unless you are a decision-maker in government or your company, think again. You can always make sure you encourage, motivate, support and empower girls from your family and circle of friends. My parents have always inspired me to believe that I could achieve whatever I wanted, and their support was my main source of energy to keep going despite the small obstacles on the way. Each of us has the power to make a difference to our own organization and to the world around us. In fact, we have an obligation to do so. Do men and women really have different leadership styles? How do we really feel about women leaders?